Holidays to Slovenia up to -70% off To take advantage of these offers, join now for free! 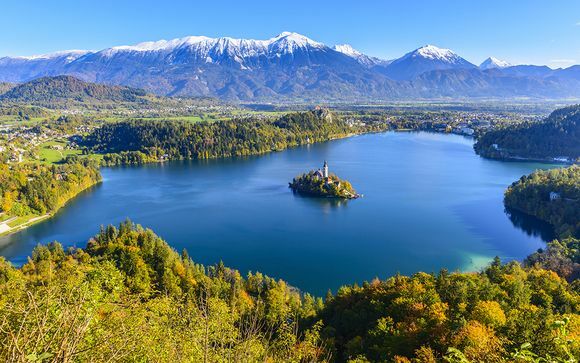 Enjoy luxury holidays to Slovenia with Voyage Privé ✅ Discover incredible Alpine scenery ♥ Gorgeous coastline and historic cities ✔ Book online today. Prosperous, stable and welcoming, Slovenia is a destination that surprises many. It's a beautiful location that offers something for everyone. It's architecturally grand, with lush forests and countryside, cultured cities, and much more. Slovenia has everything you need for a perfect hiking trip in the summer and skiing in the winter months. Not only is the country beautiful, but the food is also delicious and you'll find yourself returning for more. If you're interested in beautiful countryside, authentic cities, stunning caves and lakes, then Slovenia is the place for you. The people are friendly, the views are amazing and it's great value. Slovenia may be a small country, but it's one that delivers on all levels. 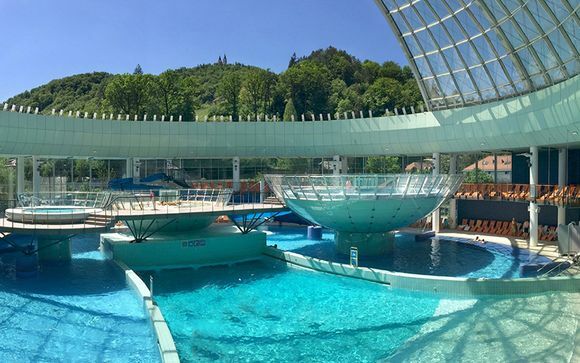 From the concealed magic of Skocjan and Postojna caves to the soaring peaks of the Julian Alps and the sparkling emerald-green rivers and lakes, alongside a sweet coastline along the Adriatic Sea, it oozes charm and beauty. Slovenia is possibly Europe's best kept secret. Neighbouring Austria, Italy, Hungary and Croatia, it is a small country with riches just waiting to be discovered. More than half of the country is covered by unspoilt forests. Pretty towns and villages are dotted across the landscape wherever you go and the north of the country is dominated by the magnificent Julian Alps. The capital, Ljubljana, is centrally located. It is an attractive and vibrant city with historic architecture, quaint streets and a lively café culture. Further south, rolling hills and lush forests abound and there is a wonderful stretch of coastline on the Adriatic close to the Croatian border. There is much to savour on your holidays in Slovenia. Not least the quiet roads, clean air and friendly people. Everyone you encounter speaks excellent English and they go about their business with an admirable level of efficiency. Looking for amazing things to do on your holiday to Slovenia? Then look no further. Below we discuss five top things you simply shouldn't miss on your holiday to Slovenia. This is a jaw-dropping cave system, featuring a series of halls, caverns, and passages with around 24km long. It's an amazing two million years old and was hollowed out by the Pivka River. You can visit 5m of the cave on a 1.5-hour tour. It's truly a wonderfully unique experience. Lake Bled is iconic with Slovenia and it delivers on all things beauty. You can walk around the lake and stop at various viewpoints for iconic photos. There are even some great restaurants dotted around the lake to stop and dine. Don't forget to explore the brilliant Lake Bled which settles atop of a high cliff higher than 100m above Lake Bled itself. It's what you would imagine this fortress to be, with ramparts, towers, a terrace and moats offering brilliant views. This magnificent castle sits at the top of a 375m-high hill located east of the Old Town. It's considered a unique architectural design, and most of it's building dates back from the early 16th century when rebuilt after the result of an earthquake. You can walk around the castle grounds for free, but if you wish to visit the Chapel of St George and Watchtower (which you should), then it will cost you a little extra. If you love hiking, then you'll love the Jullian Alps. There are many routes to choose from which vary in levels of difficulty. This means there is something for everyone. There are even many opportunities to ski when the season is right. Slovenia has lots of lovely waterfalls to choose from. Our favourites are the magnificent Savica Waterfall, which cuts deep into a gorge 78m below, and the beautiful Kozjak Waterfall which is considered one of the region's loveliest waterfalls (the walk to get there is beautiful) which leads into a green pool. Slovenia has lots of wonderful hotels, but to help make your holiday to Slovenia even more special, we've selected our best Slovenia hotels and some special features about them. This is a beautifully elegant hotel which is located inside a historical Art Nouveau building. It's ideally located in the centre of the capital of Slovenia, Ljubljana. 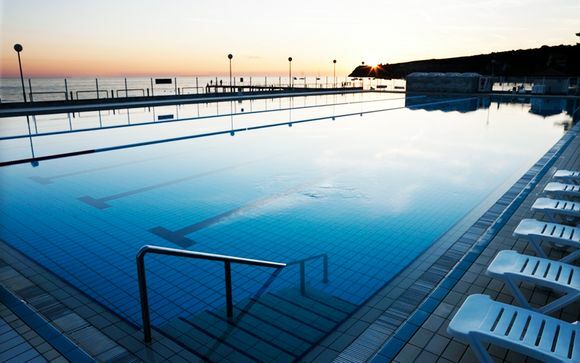 Top features include a Finnish sauna, a wonderful indoor swimming pool, and a fitness centre to allow you to unwind. 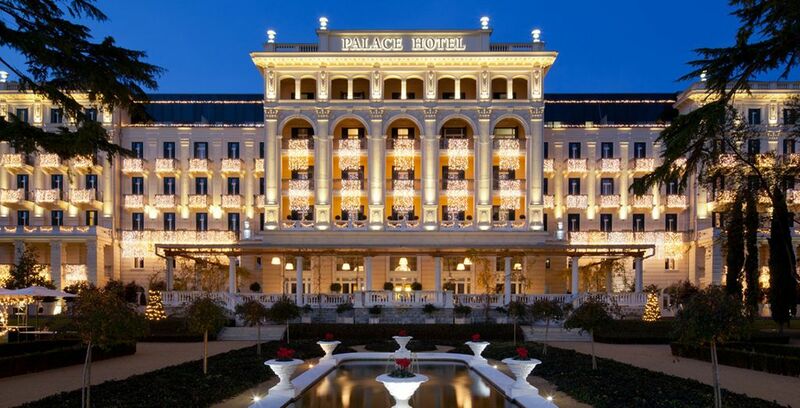 This is a stunning 5-star hotel perched on the Adriatic Coast. This is a contemporary, world-class hotel with the Old World charm throughout and it's beachside location is perfect for relaxing. Top features include a Spa with a sauna & hot tub, fitness centre, indoor pool and garden. This four-star hotel will allow you to experience the absolute beauty of the Slovenian countryside. This hotel located in Rimske Toplice, which is considered one of the most beautiful places in all of Slovenia. Modern tourist services and rich tradition flow together here which allows you to experience a new destination in style. After you've spent the day exploring all the top sights, you can return to this brilliant hotel and relax. 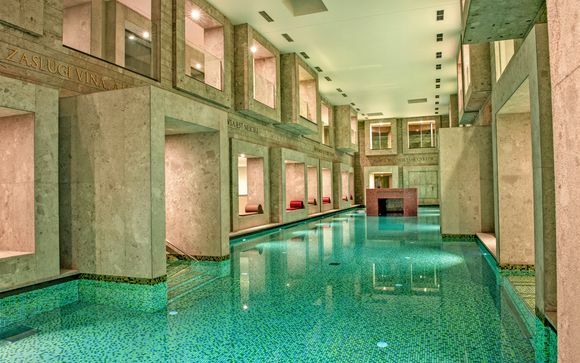 Top features include an on-site wellness centre, Roman baths and on-site restaurants. We also offer a variety of hotel combinations which allow you to stay in luxury whilst exploring all that Slovenia has to offers from both the tranquil countryside to the golden sand beaches. What is the weather in Slovenia? The weather in Slovenia depends on the time of year. July is the hottest month in the capital Ljubljana with an average temperature of 20°C (67°F) and January is the coldest month coming in at -2°C (29°F). The wettest month is October with an average of 70mm of rain. If you want to ski then you should visit in the winter months. To the north, the lakes and mountains of the Julian Alps offer you fabulous hiking opportunities. You will encounter primaeval forests, sparkling lakes, high Alpine meadows and many astounding waterfalls as you follow the well-marked trails. Lake Bohinj, the picturesque town of Bled and Kranjska Gora are all excellent bases from which to explore the mountains and offer ready access to the striking Triglav National Park. From Kranjska Gora the dramatic Vrsic Pass wends its way over the mountains to the gorgeous So?a Valley beyond. 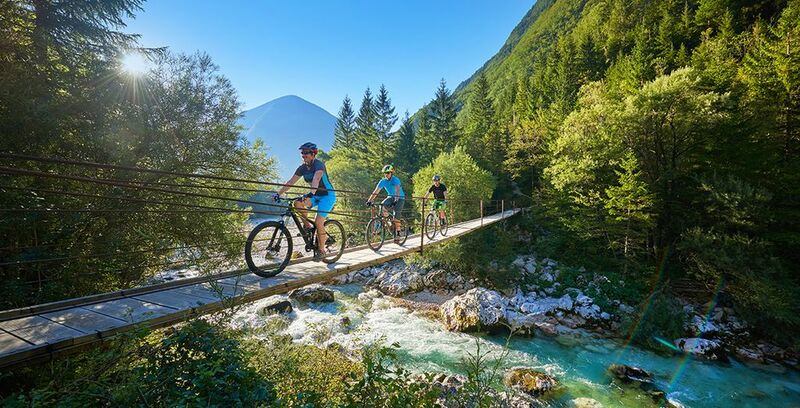 Here, the small town of Bovec attracts kayaking and white water rafting enthusiasts. If you enjoy adventure sports then the Julian Alps are also the perfect place to try zip lining, horse riding, paragliding and quad biking. The Capital, Ljubljana, is a small and compact city making it very easy to explore. The banks of the Ljubljanska River are perfect for a peaceful stroll and there are many excellent bars, cafés and restaurants to enjoy. The excellent Slovenian cuisine features Italian and Hungarian influences together with local specialities including delicious Štruklji (cheese dumplings). In the centre of the city there is a vibrant outdoor market with a vast array of fruit and vegetables, meat, fish and fresh flowers. Above the city centre Ljubjlana Castle sits proudly on Castle Hill and can be reached on foot or by funicular railway. Slovenia is quite cheap compared other European countries. You could easily get by on a budget of around £20-30 per day, but you could increase this depending on where you are dining and the activities you are undertaking. For a comfortable stay that allows you to experience everything then we would recommend £50 per day. Slovenia may be best known for its Alpine scenery and pretty capital but there is so much more to explore. The awe inspiring Škocjan Caves to the south are a must see. Nearby you will find the Lipica Stud Farm, home of the world famous Lipizanner horses. Slovenia also boasts a short but gorgeous stretch of coastline on the Adriatic where there are two principle resorts. 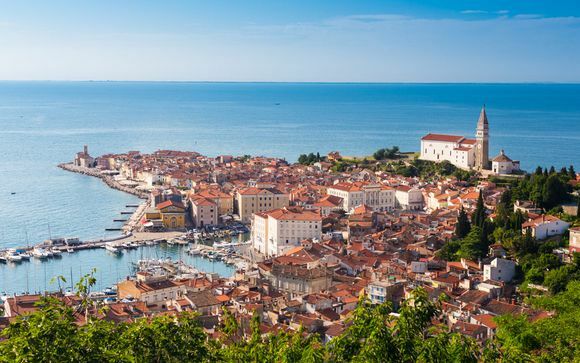 Portoroz is the more modern and lively whilst Piran is a pretty town built into the hillside with impressive Venetian architecture. Wherever you travel in Slovenia you will be enchanted and surprised in equal measure. Our hand-picked offers and exceptional discounts will ensure that you have a memorable stay. Sign up today to see all of our fabulous offers and to create alerts for exciting future sales.